The U.S. Justice Department will allow German drugs and pesticides group Bayer AG to acquire Monsanto Company in a $62.5 billion deal, after the companies agreed to sell more assets to win antitrust approval, the Wall Street Journal reported. Although widely used across the world, many Bayer and Monsanto products are highly toxic for people and planet – an ironic illustration of our broken global food system. One kind of problematic Bayer insecticides are the so-called ‘neonicotinoids’, whose active ingredients are a main driver of the large-scale death of bees and other pollinators. Although this has horrendous consequences for ecosystems and food production, Bayer is unwilling to relent and has started an outright lobby war to overturn a partial ban in the EU. 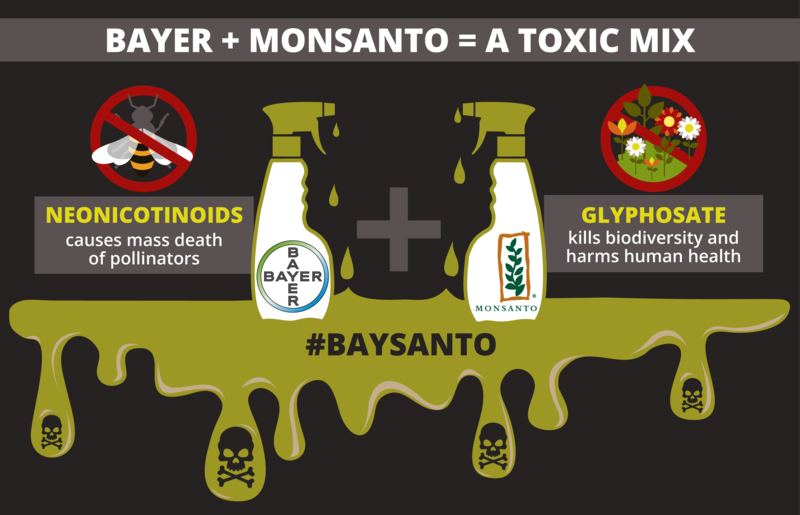 By the advice of EU food safety agency EFSA, the partial ban was issued for three neonicotinoids in 2013, which led Bayer to hire ‘product defense company’ Exponent to attack the scientific evidence underlying the ban. Right now, Bayer is suing the European Commission to see this partial ban overturned. But its war on science looks set to be in vain: the EU is expected to announce a complete ban on neonics this year. In an attempt to at least limit reputational damage, the company is running ‘Bayer Bee Care Centers’ – a glaringly obvious greenwashing inititive. For Monsanto, its biggest worry is also its biggest cash cow: glyphosate, the active ingredient in its flagship weedkiller RoundUp, was found to ”probably cause cancer in humans” by the World Health Organisation. Still, its wide-spread use means glyphosate residue can now even be found in human urine and breastmilk. This year the EU has to decide whether to grant another 10-year market authorisation for glyphosate-based weed killers – given the WHO findings, an EU ban of the substance should be beyond debate.